Jacobs signaled that he will listen and learn and then embark on a team effort to set the course for the future. 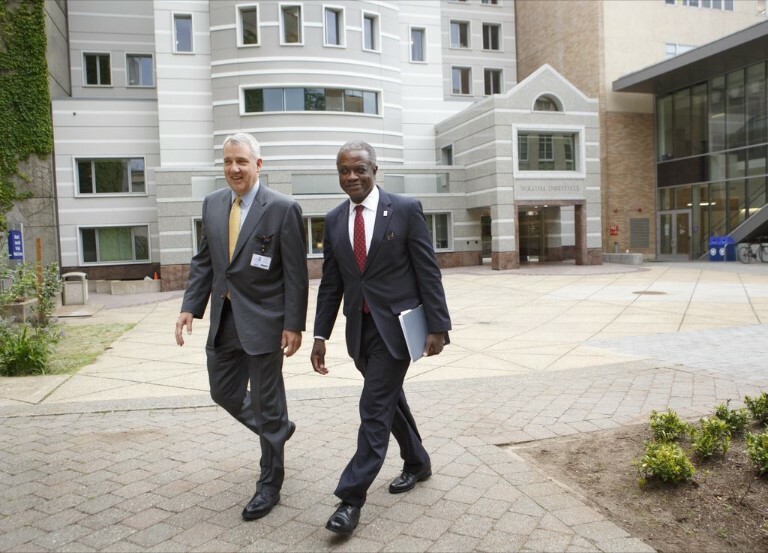 Past President Joe Robertson walks with his successor, Dr. Danny Jacobs, on the Oregon Health & Science University campus. Oregon Health & Science University has a new president. Dr. Danny Jacobs, a trained general surgeon, took the helm this week, attending ceremonies, meeting with people and conducting interviews. In a phone conversation with The Lund Report, he said he plans to listen and work with a team to craft a strategic plan for the university, Oregon’s only academic medical institution and its largest public employer, with nearly 16,000 staff members. But Jacobs did not get specific about his plans or priorities. Jacobs replaces Dr. Joe Robertson, who announced in October that he would step down following a diagnosis of multiple sclerosis. During Robertson’s leadership, the university won $1 billion for the Knight Cancer Institute and went through a period of expansion, especially on the South Waterfront. Jacobs comes to Portland from the University of Texas Medical Branch where he was vice president, provost and dean of the School of Medicine. His salary at OHSU was set at $1.1 million dollars, with the potential for nearly $500,000 a year in bonuses. He spoke with The Lund Report about his initial plans and style. The interview has been edited for brevity and clarity. Q. During the interview process, you emphasized collaboration but didn’t share details about your vision or potential plans. Now you’re in the job, overseeing an institution with 3,000 faculty, with research and clinical components, plus the medical and dental schools. What are your top priorities? (My) top priorities for the next several months are to listen and learn as much and as quickly as possible during this onboarding and transition phase. It’s not so much what I think the vision is for the institution as it is what the members think the vision should be. We’ll do things like ask ourselves collectively how would we like the organization to be described in the near future and intermediate (future) and long-term. Strategic planning is critically important. (It) is an iterative process, which means that we are going to be refreshing, revisiting that strategic plan over the next several months, asking ourselves not only what our goals are for the institution but also what are the specific objectives that will allow us to achieve that and what particular tactics do we need to use to achieve that particular vision that’s set by the crowd, and then how do we measure our performance. Q. So you have no priorities, nothing in particular that you want to do? I want it to be excellent in all things. In terms of patient care, I want us to be excellent. I want us to continue to pursue research and be recognized as a top institution. I want us to extend our reach - when we talk about global health - it’s about what happens around the nation and around the world (and) to do that all through the lens of what’s best for the health and well-being for Oregonians. I’ve talked about how we integrate the various functions that are part of academic duty -- patient care, research, education -- with our expectations around performance. If you think of it, it’s a two-by-two grid where everything at the top right is excellence across all missions, that’s where I want us to go. Q. Under the leadership of your predecessor, Joe Robertson, OHSU raised $1 billion for the Knight Cancer Institute. Do you foresee any similar efforts and if so what area or areas are ripe for bolstering? Capital campaigns are going to be increasingly important. The way I would think about this is to ask questions like, “Now that the Knight campaign has been completed, what do we need to do to increase the dollars available from philanthropic sources?” Why is that important? That gives academic health centers like ours the opportunity to invest in those things that are critically important and otherwise (would be) undersupported. Compared to 10 or 15 years ago, fewer dollars will be available. In academic health, (we need to) be prepared to do more with less. I would like us in the near future to have a discretionary fund for every faculty member and a scholarship for every student. Q. Administrator salaries at OHSU have grown tremendously over the past decade, but faculty pay has only increased marginally. Do you plan to address this and if so how? What I have heard from the faculty members here is it really is what I’d call the total value proposition, meaning it’s compensation in the traditional sense but also, do people love to coming to work every day. In the private sector, salaries are higher. I love what I do and therefore I think that is as key to the members of the institution as it is to me. What can we do about the quality of the work environment to have people feel like they’re part of something bigger while compensation is fair and balanced relative to market forces? Q. But the difference between administrator salaries and faculty, will you address that? Once we launch the strategic plan and we ask our members, what are our concerns, I wouldn’t be surprised if that came up as an issue. It certainly happened in my previous life. But it’s not just me identifying what’s important, it’s the members of the organization saying, “Hey, this is an issue. Let’s address it.” Then develop a plan to address it as appropriate. Q. Some faculty have complained that OHSU is more focused on its bottom line and has adopted a corporate attitude rather than being focused on being a university, research center and provider. Do you plan to address that and if so how? Academic health centers (are) in some people’s minds becoming too corporate. Academic health centers have to have margins in order to invest in those things that are important for academic duty. That means education, innovation (including research) as well as patient care. How (can we) keep the heart and soul of academic medicine while being responsible to the bottom line which is real and must be addressed? Q. Are you aware that there is a high level of faculty dissatisfaction at OHSU and a lack of confidence in executive leadership? And if so, how do you plan to address that? I wasn’t aware of that. It’s an interesting disparity because I met with several hundred people during the interview process. One on one, where I would say folks were open and frank and direct about their opinions of the institution. In terms of a great level of dissatisfaction, I wouldn’t have said that that (was) my impression. I will look very carefully at this survey that’s just been completed and then we will hone in on areas that require improvement. As they are identified, I want your readers to know that we won’t just turn and look the other way, we will address them. But the sense of community here is extraordinarily powerful. I don’t want folks to get the impression that this institution isn’t strong. But no institution can rest on its laurels. We’re not going to do that. We will look at every opportunity to make ourselves better. And we’ll do that in an open and honest fashion. Q. What kind of a difference do you plan to make for patients? This university is very well perceived among other institutions in terms of the quality of its care. I would reference the Vizient (Quality and Accountability Study) that shows this institution to be No. 12 among 96 institutions in the country in terms of the quality of the health care. That’s a pretty good place to start. There are two things that are important in terms of health-care delivery in the future. The first is to make sure our care is patient-centered. OHSU has been doing (that). (It) is a leader. Then increasingly what I would expect (to) come out of the strategic plan is how can we use the team to care for the patient. It’s about all the specialists working together as a team where the patient’s interests are front and center. Q. Student debt among OHSU medical and dental students is among the highest in the nation. Do you plan to undertake efforts to reduce student debt? We will look to see what our costs are and decide the rational basis for those costs. That’s why I think philanthropy becomes so important. At the same time we have to ask ourselves what are our students getting in return. Expense is just one part of the equation. Q. Diversity is a big issue at OHSU. It’s made strides on gender. But what about race? Do you plan to boost funding for the Center for Diversity and Inclusion which is in charge of that effort? No plans at this point because we have to complete the analysis, as I said before. When we talk about our priorities, where the resources are going to be limited, we have to have margins to be able to invest, then we will decide how we will allocate those dollars. But based on what I’ve heard so far, I think that on the list on the top priorities, it would be continuing the great work around diversity and inclusion that’s already happened at OHSU. Q. In five years, what would you like to say you’ve accomplished? Once we define reality and we say, this is where we are, once we say where we’d like to be on the five-year horizon, I’d like the folks to say that Dr. Jacobs helped us get from where we are to where we wanted to be in that time period, by measures that we think are important and not just what Dr. Jacobs thinks is important. I am so incredibly excited that Dr. Jacob's has been named president at OHSU. So far he has exhibited a positive approach to running the organization. He uses inclusive language and is intent on observing first so that we can collectively get to our future state- together. I think that big changes are on the horizon at OHSU and Dr. Jacob's will be at the forefront of leading that positive change.